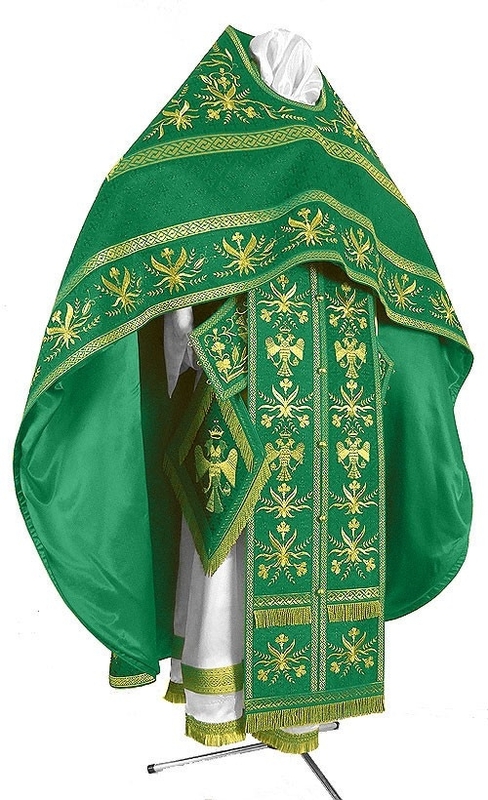 Istok Church Supplies has an abundance of magnificent Russian Priest vestments in green and gold. 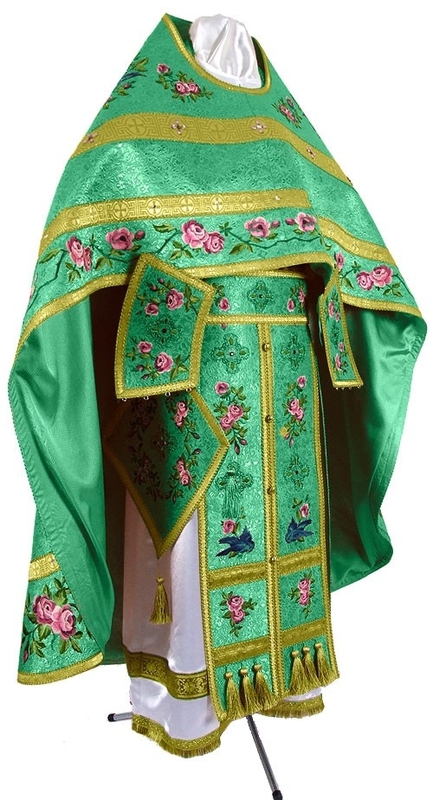 Whether you want to dress appropriately for Palm Sunday, Pentecost, Feasts of Prophets, Feasts of venerable Saints or any other special occasion associated with the liturgical color green, our accomplished and knowledgeable ecclesiastical tailors can render perfectly fitting custom vestments. 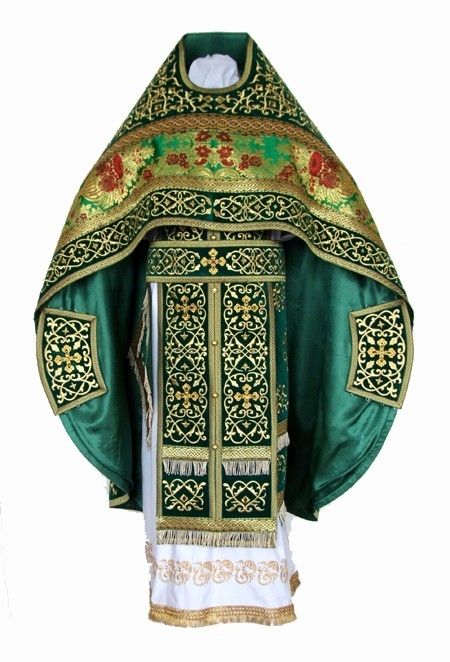 Green is the color of life and our green and gold Russian Priest vestments are just what you need to bring to life Orthodox Christian teachings for your parishioners. Spectacular and break taking, they are available in myriad fabric choices such as metallic jacquard brocade, rayon jacquard brocade, natural German velvet and embroidered materials. No matter which fabric you choose, you are sure to enhance your stature and inspire the devout. 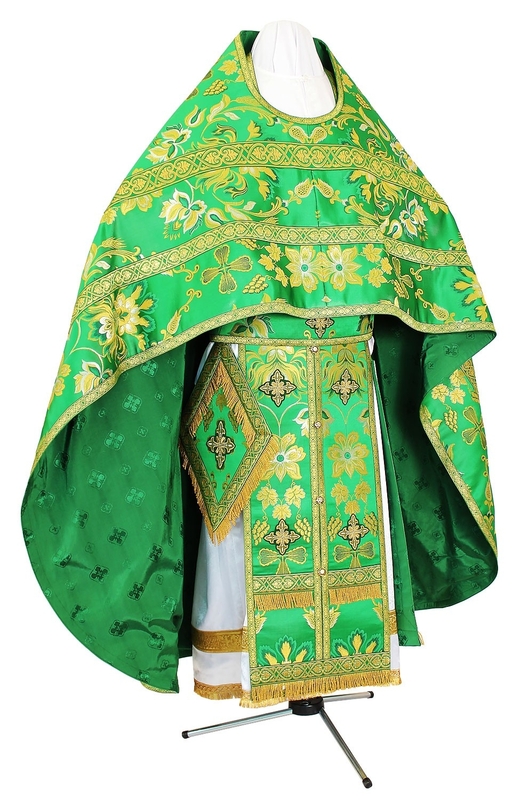 Our green and gold Russian Priest vestments are offered as complete sets so you don’t have to look anywhere else. We include a phelonion, epigonation, epitralhilion, zone, epimanika and nabedrennik as items of each set. Customers can also add matching chalice covers and a matching podriznik to their order. We provide natural rayon lining for vestments and customers can add natural velvet inserts to their order for added appeal. Customers can also select from given list of options for embroidered icons. The embroidered icon will be stitched onto the back of the garment. We provide three embellishment options – standard, premier and luxury. 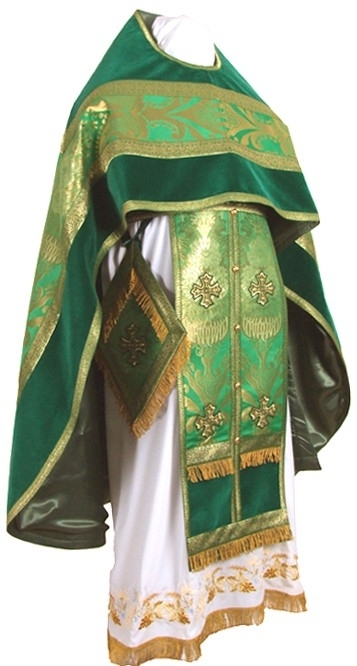 We excel at creating custom liturgical vestments based on individual measurements. Our highly skilled artisans in Europe are armed with knowledge of ecclesiastical vestment canons and create perfectly fitting Priest vestments that enhance the reputation and standing of the wearer. Whether you want to order one for personal use or to gift someone, we request you to send the exact measurements. We are constantly adding to our stunning collections, so feel free to revisit for the latest designs!